China recorded its fourth consecutive win over Korea in the final of the Asian Junior Mixed Team Badminton Championships, with budding stars Chen Yufei and Du Yue leading the way. Team China has been ruling the Asian Junior Championships since their stunning loss in 2012, when it took a team with Kento Momota, Nozomi Okuhara, and Akane Yamaguchi to win Japan its first title. 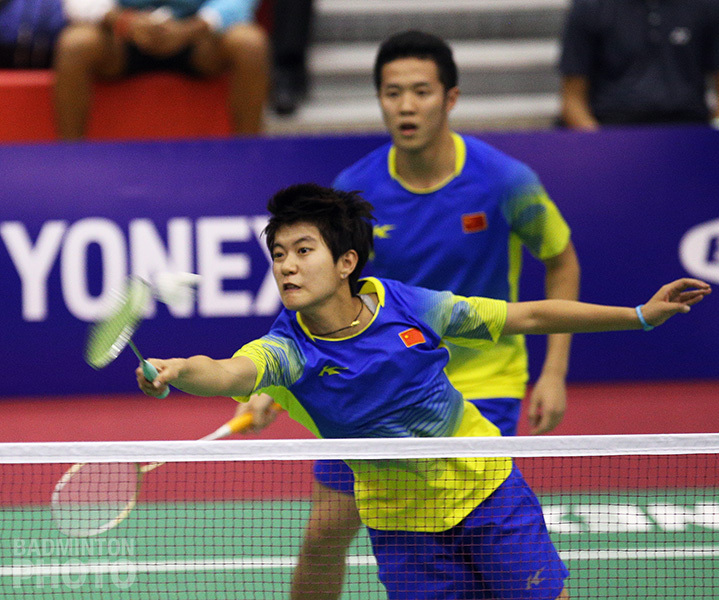 Any worries the Chinese might have had about their team being severely weakened by the graduation to the senior ranks of the likes of Zheng Siwei, Chen Qingchen, and He Bingjiao were dispelled in today’s mixed team final in Bangkok. 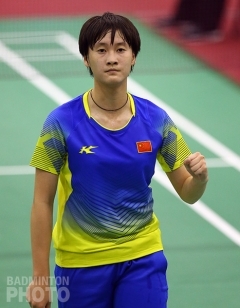 Even in the singles disciplines, where China has only one one of the past twelve World Junior titles, their ace shuttlers finished the team event without defeat and had a particularly easy time of it in the final against Korea. The tie started off with the expected win from He Jiting and Du Yue (pictured top). This pair finished as runners-up at last year’s World Junior Championships and Du already has a Grand Prix Gold title to her name. The Koreans, including Kim Won Ho in his Asian Junior debut, lasted longer than any other opponents He and Du had faced this week but they still went down in straight games. Kim Won Ho did bounce back to win a very close boys’ doubles contest against Han Chengkai / Zhou Haodong, who were runners-up in last year’s individual event. Kim, the son of 1996 Olympic gold medallist Gil Young Ah, was joined by his high school team-mate Kang Min Hyuk (pictured above) and together they saved an incredible six game points in the opener before scraping by 24-22, then again winning by two in the decider. In the girls’ singles, Korea rested Kim Ga Eun, who in the semi-final had bested Thailand’s Chochuwong, last year’s runner-up. With that Kim being saved for the girls’ singles, it was left to her team-mate Kim Hyang Im to take on Indonesia Masters runner-up Chen Yufei (pictured). The individual event kicks off on Wednesday morning. He Jiting, who finished last year’s World Juniors with one gold and one silver, is half of both of China’s only top seeds but the Chinese youngsters will have the momentum on their side after the success in the team event. Thai hopes will once again be focused on the girls’ singles event, this time featuring 2015 runner-up and current top seed Pornpawee Chochuwong but Thais are seeded first in both singles events.